Today, Sunday 10th July 2011, the Prime Minister of Australia, Julia Gillard, unveiled proposed legislation to place a cost on the emissions of Carbon Dioxide (CO2). To hide the fact that the Tax is on a naturally occurring gas we all breathe, both in and out, she’s given it a trendy name to obscure the fact that it is indeed only CO2, by referring to it as a ‘Price On Pollution’. The largest emitters of this CO2 gas are those large scale coal fired power plants, and this is where this Tax is aimed at directly. 36% of all CO2 emissions come from the generation of electrical power. The intent of this legislation is to lower those emissions, but the Prime Minister has been so blinded by the amount of money to be made from this, she’s just flat out not even bothered to check her facts. So then, let’s just look at some of those facts shall we? This list is of the top Companies by emissions. Prime Minister Gillard originally planned to Tax the top 1,000 emitters, but to ensure that the people who are keeping her in Minority Government stay onside and allow her to get her hands on all that money, the Greens and the Independents, she compromised, and now it’s just the top 500 Companies by emission, or as she artfully now refers to them as, ‘the Top 500 Polluters’. There’s no need to show the list of all 500, because these top 20 will be providing the bulk of the money. Notice the small black squares alongside some of those Companies. That indicates that those Companies are suppliers of electrical power on a large scale. The first 4 names on that list and 14 of those Top 20 names there are large scale electricity providers, and the amount they will be giving the Government comes in at almost $4.5 Billion, just from the electrical power generating Companies. She tells us that she will be giving back 50% of all money raised to almost 90% of households in Australia, and that amount will almost cover the increased cost of their electricity bills, because those electrical power generating Companies will be passing that increase directly down to all consumers. One of the things that Julia didn’t check was the actual consumption of electricity, because only 38% of all power being consumed is in that Residential sector, with 37% in Commerce, and 24% in the Industrial sector. So Julia is magnanimously giving back the money to consumers to cover their increased bills, and a little bit extra she tells us. However, those other two sectors will not be compensated for the increases in their electricity accounts, and the extra they pay will then also be passed onto consumers in everything they purchase, because every shop falls into the commerce sector, and everywhere people work falls into Commerce and Industry. Every consumer of electricity will pay. That leads us into the next area where Julia failed to check her facts. This chart is of actual power consumption on a time based scale. The hours in a day go across the page and the total percentage of power required is on the vertical axis. This chart is similar across the whole of the Western World wherever there is a constant and regulated supply of electricity. 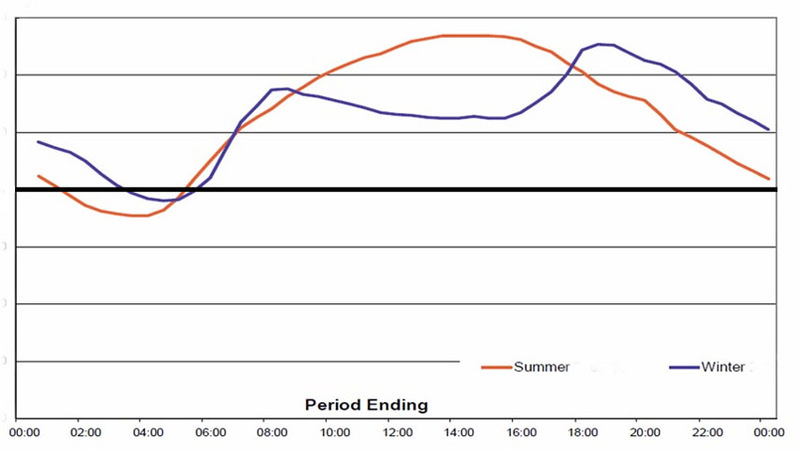 The orange line indicates power consumption for the Summer Months and the blue line is for Winter. The black line across the page shows that everything below that line is being consumed 24/7/365, and that line is around 60 to 65%, indicating that for every Watt of power being generated, almost two thirds of that is required for 24 hours of every day. 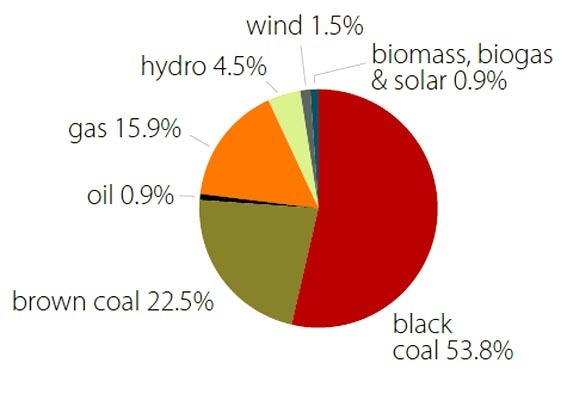 All of that absolute requirement is currently being supplied by large scale coal fired power plants, as you can see on that pie chart at the right here, which shows where all the electrical power in Australia is being generated, and this shows those amounts by actual consumption. By the way, this chart is from the same Labor Government seeking to introduce this new tax, so it’s not something conveniently plucked out of the ether to make a point. Coal fired power makes up 76.3%. When you also add in the power generated from Natural gas, which also emits CO2, that total comes up to 92.2%. 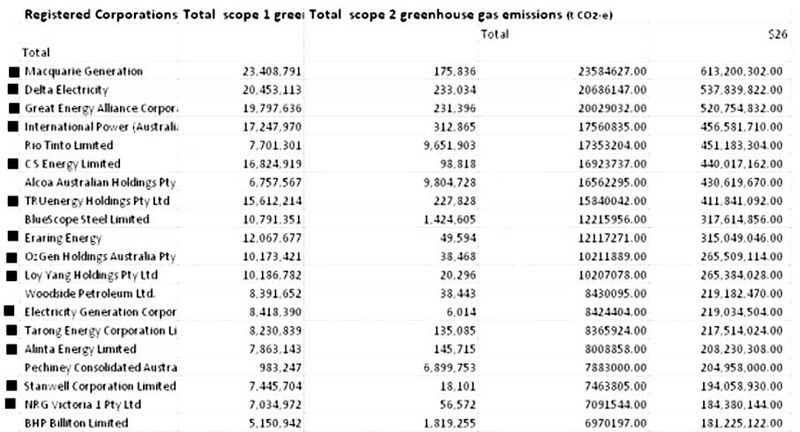 Add in the oil fired sector and that total from all CO2 emitting power generation comes in at 93%. So, Julia’s great big new tax is aimed to raise its money from electrical power production, what Julia refers to as the ‘big polluters’, not as providers of what is an absolutely essential service, but from entities she sees as deliberately seeking to in effect kill us all. So, will the introduction of this tax do what she tells us it will, reduce those emissions? Well, no, it wont, and again, here’s where Julia (again) failed to check her facts, blinded by the huge income this tax will generate. Those large scale coal fired power plants supply the huge amounts of power to keep the Country actually running. A large scale power plant just cannot burn less coal, hence emitting less CO2. Those large scale plants run at their maximum rate ALL the time. Those huge generators, some weighing up to 1350 tons, and rotating at 3000RPM, or 50 times a second, have to keep doing that. They either rotate at that speed or shut down completely. They cannot run up and down at a whim. When they do shut one generator down at a time for routine maintenance, other smaller plants have to come on line for that time to cover the huge amount of electricity being lost from the grids. Even if on the very rare occasion when demand falls, and those huge levels of power are not required, the plant cannot cut back on its emissions. Because of the huge weight of the generator/turbine complex, it just has to be kept turning over at its maximum rate all the time, because it takes days to run the generator back up to the required speed, so, even when on the rare occasions that plant is not supplying power from one of its up to four or eight generators, those emissions will remain constant. There will NEVER be a time when all the generators at one plant are turned off. That immense weight of the generator is driven by a huge (and also quite heavy) 3 stage turbine. To drive that, immense amounts of high temperature, high pressure steam are required to make that turbine actually turn over at that rate. To ‘make’ that steam, there has to be a huge furnace to generate the immense heat required to produce that steam. To feed that furnace, crushed coal is forced in with air. In those large scale coal fired plants, the crushed coal is being burned at the rate of one ton every four and a half seconds. Anything less than that, and the plant stops. Full stop. No correspondence entered into. On average, as each one ton of coal is burned, 2.86 tons of CO2 is emitted. So, the plant either emits what it always does, or it stops. If it stops, well, problem solved say those green urging ‘friends of the dirt’. No emissions. Also, no electrical power. Huge amounts of electrical power are removed from the grids. Imagine if you will what happens then. Absolute chaos. Remove that power from the grid, and other plants, now hopelessly overloaded also move into shutdown mode, leading to cascading power failures all across that grid. No electrical power …… no, well, no nothing. Imagine the fury when that happens. Straight away, the people will look to who caused that, and Julia, all eyes will turn towards you. If those large scale power plants go offline, that will amount to political suicide. So, this huge new tax is aimed squarely at a target that cannot do anything to actually achieve what she tells us it will, that being to reduce emissions. Keeping in mind that those large scale plants are either running at their maximum, or stopped, she has made provisions in the legislation to ensure security of electrical power delivery, as it is artfully termed. If those plants fall into economic difficulties, she has made provisions for that. Remember, those plants are now virtually worthless, because of the huge new impost on them each and every year, so plant operators cannot just up and sell them off, because the value of the asset has diminished almost to zero. This also affects the operators ability to borrow using the value of their asset, the Plant itself, as collateral to service loans needed to purchase the Thermal coal to operate the plant, up to 6 million tons a year at the going rate for Thermal coal, currently around $50 per ton. In some cases large scale plants are built at the site of a coal mine, but for plants not near a mine, they also have to pay transportation costs for that coal on top again. That coal is delivered by rail, huge trains one kilometre long hauling 100 hoppers and pulled by 5 locomotives, each hopper holding 100 tons, hence 10,000 tons of coal, and the rate of delivery for large scale coal fired plants is one of these train loads every day, and that also is not cheap. So, bean counters might just add two and two, and find it’s not worthwhile to stay in operation. In the proposed legislation, loans will be made available to operators who do fall into difficulty. The intent of the legislation is to reduce those CO2 emissions. If the plant closes down, then those emissions have indeed fallen, in fact all the way back to zero. That means that the source of income FOR the government, (those taxed CO2 emissions) is now not available, so the Government loses a huge amount of income to give away to prospective voters in the form of compensation. It has however achieved its aim, that of lowering emissions. So, here’s what the Government is doing. It taxes the plant operator for its emissions, and if they have problems, the Government will then give them loans enabling them to stay in operation, and thus, to keep emittting. Somewhere in all of that is a form of logic I am completely missing. We are also told that the intent of introducing this tax is to drive the move to the use of renewables to replace that coal fired power, and in fact there is provision in the legislation for an amount of around $2 Billion each year to be put aside for renewables. Senator Christine Milne’s Transition to Renewables – At What Cost? The three most recently announced renewable power plants will cost around $3.3 Billion and the Government is subsidising half of the original construction cost. The total power supplied from all three plants is less than 14% of the actual power currently being delivered from JUST ONE coal fired power plant, Bayswater, and while Bayswater delivers its power 24/7/365, the best these three renewables can achieve is a theoretical maximum of 9 hours a day at the absolute best. So, this new Tax fails to do anything we are being told that it WILL do. You would think that being Prime Minister of Australia would give you access to reliable and accurate information. I mean, this is all technical stuff, so no one would suggest that she should know any of it. However, surely she has access to people who can advise her of things like this. No, there’s too much money to be made from this. When people finally realise some of these things, there really can only be that one conclusion. Trouble is, we all pay for it. I am interested on the solar thermal array being built as an adjunct to the Liddell coal power station. Is is operational? How much did it cost to build? What is the cost of producing electricity using the solar thermal array? There could be some potential in using clean/renewable tech as an adjunct to coal powered plants. Is it not possible to somehow attach a filtering system to coal power stations that would capture the emissions, separate from oxygen and compress the residue to a solid? Something like you suggest is not possible at the moment, and while it is a reasonable suggestion, it has the same improbabilities that sequestration (Carbon Capture And Storage) has, only is vastly more complex, if it could even be achieved at all. To actually even have that technology in the first place and then to retrofit it to existing technology becomes even more difficult, and what needs to be realised is that an average large scale coal fired power plant emits around 18 million tones of CO2 each year, so the scale of actually even capturing the emissions in the first place is difficult. Tony, I’ve asked you elsewhere about these matters, so forgive me if my inquiries fatigue or repeat. I’d like to get a ballpark on one speculative proposal. All other issues excluded, what would be the net saving in coal consumption (or, in the language of fashion, of carbon emissions) if every single coal plant in Australia was replaced by a new coal plant which maximised efficiency in every conceivable way? Cost would be no object, of course, in view of what governments are prepared to spend on what they so optimistically term “alternatives”. No doubt one could complicate the question by proposing improvements to location and transmission, and if you feel those factors might make a big difference to the final savings, no doubt they are worth putting into the mix. So, I’m not talking about coal versus something else. I’m talking about the newest and best coal facilities (in prospect only, of course) versus existing coal facilites. Why am I so interested in something that, as you’ve pointed out, cannot happen in the current intellectual and political climate? Well, if a modern facility could consume 10% less coal than an older one, the unfudged reduction in “emissions” for those concerned about such things would be dramatic. This would also appeal to people like me, for whom the word “thrift” still carries a certain nobility. If the economies of modernisation were even greater than 10%, and electricity from coal became still more reliable and affordable, I suppose we’d have to factor in less visible advantages. People would be less inclined to do desperate and/or wasteful things to save on electricity. An extreme example: new migrant families might not try to burn oleander trimmings in the lounge room if heating was cheap. (Tragically, that has happened.) Of course, I realise that you can’t easily factor in such savings. If coal provides most of our electricity supply, I would think that any improvement to its efficiency would matter. If you were to amaze me by suggesting that an improvement of more than 10% was achievable by replacing old with new, I would be thinking that our failure to modernise coal power points to stupendous insincerity or folly. Tony, if you were to say to me now that new efficient coal power facilities could reduce coal consumption by more than 15% I would find it hard to believe you. I cannot credit fellow Australians with such a level of insincerity or folly.Nevertheless, I’m prepared for the worst. You’ve answered my questions before with great thoroughness, and I’m not meaning to plague you. Here, a ballpark percentage would suffice. (mosomoso) Rob, thanks for a really great question. In your question, you mentioned that if savings were more than 15%, you would find it hard to believe, but the truth is that this can actually be believed. China is the only place currently constructing new large scale coal fired power plants. These plants are half the size, produce more power, and burn considerably less coal. There actually was a proposal to add Two generators to the Vales Point plant in NSW, and also another 2 generators to the Bayswater plant near Muswellbrook, also in NSW. Those generators were of 1000MW each, and currently the largest are at Bayswater at 660MW, and they weigh 1342 tons each. Those new 1000MW generators weigh a little less. Now, the technology works backward from there. The lighter the generator the less weight the driving 3 stage turbine needs to be. Those newer turbines are considerably better, hence greater efficiency and more drive from less. Because the turbine is smaller, you need less high temperature high pressure steam to drive it. The newer technology boilers are considerably better than the older ones, hence making more steam from less. The furnace provides the heat to boil the steam. New furnaces are supercritical and also hypercritical (different processes) Because of that, they burn considerably less coal to get the heat required. Then there are better crushers feeding the coal into the furnace, better burners, better air injection, all in the furnace. Those new technology large scale coal fired plants in China are producing twice the power from a smaller plant than older technology plants we have here in Oz, keeping in mind even the most recent is from the late 70′s early 80′s hence almost 30 years old. The new plants in China are currently producing the same total output power by burning approx 4.5 million tons of coal each year. The average large scale plant here in Oz burns around 6.5 million tons, so the saving in coal burned is almost 30%. As some plants burn more than others those savings would be averaged. On an existing large plant for large new plant scale, you would be looking at about 20 new plants for all of Australia. The CO2 emissions savings would be around that 30%. That’s not a wild guess, but as you can see, calculated using already established data. Notice I have not included Carbon Capture and Storage because that is something that will NEVER be achieved on any scale, let alone on the large scale the dreamers theorise. The cost would be cheaper than replacing them all with renewables by a factor of around seven to ten, and you would get 24/7/365 power instead of a best case scenario of 9 hours a day. Again, thanks for the wonderful question. 30%. And that’s assuming Aussies can’t come up with something better than China’s facilities. So we can have a 30% reduction in coal consumption that is real, unfudged, unsubsidised? With no blackouts, no self-inflicted deprivations? No wonder our Green Betters hate the idea. Tony, I might mention this reply of yours around the net. when the Snowy Hydro Scheme was going in, those early plants were US and English design. When the last plant went in Tumut 3, they used the Japanese technology, bigger head, better Francis turbine, and smaller generators producing almost triple the power. The same principle will apply in this case. All that better coal fired plant technology is now in China, so we’ll need to either copy that, or go to them for that technology. The new proposal for Bayswater proposed two by 1000 MW generators to almost double the generating capacity. Those two new generators would have had reverse technology back from those generators. To produce the existing 2640MW Bayswater currently burns 7.5 million tons of coal. To produce the extra 2000 MW, they would burn an extra 4 million tons of coal. 30% less coal by ratio. Fat chance that proposal ever getting up. The cost was a ‘mooted’ $1 Billion, so much cheaper because it is already at an existing Plant. For that money you’ll get 15,300GWH delivered to the grids 24/7/365. The cost for the 3 most recently announced renewable plants is a starting price of $3.3 Billion, and for that you’ll get 2600GWH for around 8 hours a day on average at best. So, three times the cost, and one sixth the total power part of the time, more expensive by a factor of 18, and with Coal fired power you get it 24/7/365. You tell me which of those options will be approved, well no guessing about. The renewables already have been approved.